The Sharks were heading for Karlskoga for the first round of play down series. In 2013 the managed to win the third and deciding game away in Alby. Alby eventually lost to Sölvesborg who took Albys spot in the Elitseries. 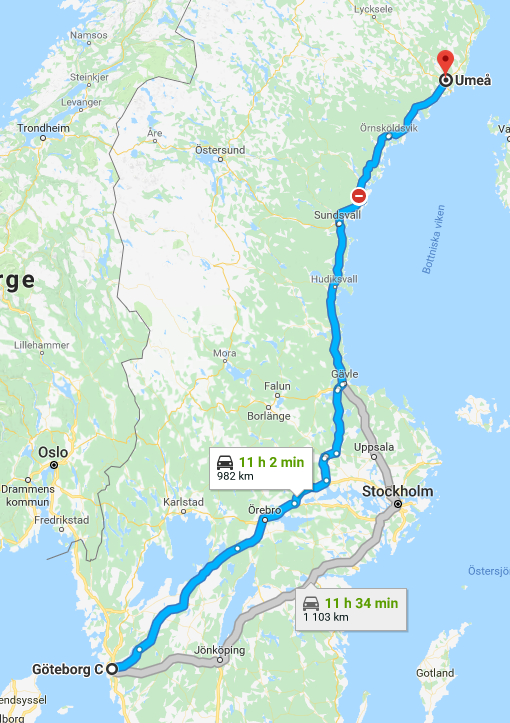 Karlskoga almost managed to avoid a playdown spot but Leksand lost one game to Sölvesborg in the last round and forced Karlskoga to the first playdown round instead of to the play offs for the cup. Althought he forecast projected light rain, the weather decided against. It was pouring at times and when the light rain took over it was just enough to keep the field wet. Since the teams were running out of days to play the series, they did all they could to get at least one game going. The field in Karlskoga is located on a hill of rocks and sand, perfect to let the water go quickly. That gave the Karlskoga team some hopes to get a game going despite of the puddles on the field, if it just would stop rain. The teams were in luck. Some time after 1600 it was decided that they should get a game going and around 1700 the Umpire called out “Play ball!”. Karlskoga Pitcher Parker Talbert was phenominal on the hill the six innings he were allowed to pitch. Niklas Hellerstedt started for Gothenburg and Christian Göttlisher took over after Niklas got in trouble after a few innings. The Karlskoga was up 14-1 after six innings. Gothenburg was forced to score at least four runs in top seven to keep the game alive. Some time there, Karlskoga did some substitutions, removing two solid players from the line up adding younger players. Gothenburg moved Patric Laffin from catching to center field adding Lundborg for catching. Khazal took over third from Weidolf. Previously Ted Bratsberg substituted Niklas Ekström on first base. 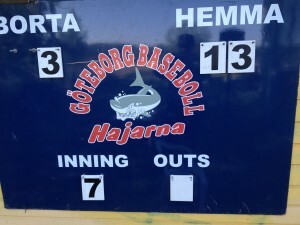 The Sharks rose to the occasion and gave Karlskoga pitching a hard time scoring just enough runs to keep the game alive and continued to score two more runs in the eight! Gothenburg entered top eight with five runs for and 14 against. Karlskoga was forced to a pitcher change when the coach for the second time entered the field in top eight with two outs and left the ball to Karlskoga veteran Kent Karlsson with Karlskoga ahead . The Sharks got the upper hand on Karlsson directly in the top ninth by producing solid hits from the burning hot Gothenburg bats. 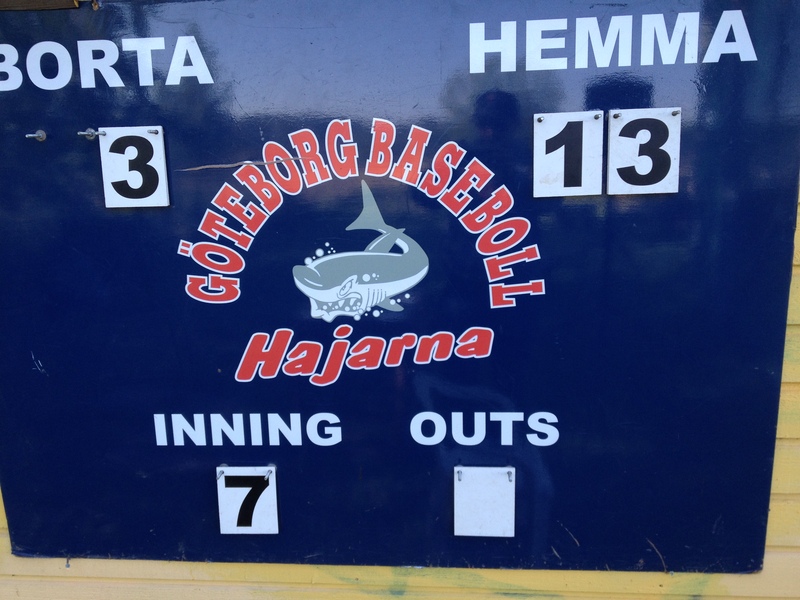 Karlskoga was still ahead eight runs but the Sharks wasn’t interested in giving up. The first five at bats all scored. Fredrik Lundborg finally got to third with two outs, representing the tying run after a phenominal comeback by the Sharks. The go-ahead-run was on second represented by Göttlisher after 10 at bats for the inning. Karlskoga managed two outs during the inning. Kahzal was at the plate for the second time of the inning and everyone was ready for the miracle! It was in some sense really well deserved after picking up the game almost tying it despite they were down 13 runs not even three innings ago. In some other sense, Karlskoga deserved to walk off with the win in game one. Kahzal hits a groundball to third which manages the paly to first for the game. So very close for an awesome comeback. The Sharks lost the second game of the series 12-2 that was eventually played when the rain calmed down on Sunday. This puts the Sharks in the second round of the down series. 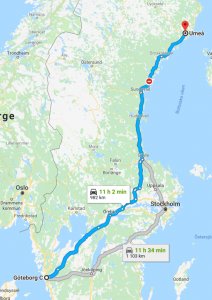 The Sharks must now play either Botkyrka or Rättvik for a second chance to stay in the Eliteseries. The rain has caused some trouble for the commissioner of finding a way to play all games. The current idea is to play the qualifying games on Sunday. Actually, it looks like whatever scenario we’re looking at, we’re playing ball in Shark Park on Sunday! See you there for games that means a lot for the future of the ball club. This entry was posted in Gothenburg Sharks on August 28, 2014 by Marcus. You could meet up with Shark representatives at Kulturkalaset in Gothenburg Thursday and Friday. Try out what a bat feels like or play catch with a friend or someone with the Sharks. You could find the Sharks in Trädgårdsföreningen between 13:00 and 14:30. Check out the official poster. See you there? This entry was posted in Gothenburg Sharks on August 14, 2014 by Marcus. The Stockholm Monarchs are visiting Shark Park on Saturday in the Eliteseries. Tranås will play the Gothenburg team in the regional series on Sunday! The Stockholm have had a fabulous season with only one loss. The Swedish National team is pretty much built around the Stockholm team. You could expect to watch some really good baseball. With this years track record the Monarchs are coming to Gothenburg expecting nothing less than two wins. The Sharks managed to score twice when the team visited Stockholm, but the teams offense have grown a lot tighter since. Some of Stockholm’s wins were really tight, so the Sharks should not have given up in advance to grab the second loss of the season for Stockholm. This entry was posted in Gothenburg Sharks on July 22, 2014 by Marcus. The Sharks woke up late this Saturday. Sundbyberg was up early and ready for the games. That mimics how the games were played. A shortened game one due to Sundbyberg’s hot bats and an exiting second game was up for display for the audience! A good thing they woke up after that! Because that was what they did! If the team weren’t awake already, Curtis Dionne made his first appearance of the season to make the final wake up call to the team. The semi-retired Shark icon had the possibility to sneak in to a game and he meant business. He took on the catching position and managed to keep up with Jason’s pitching quite well. The Sundbyberg were forced to see their stealing numbers go down to the floor and was picked off once. Jason Norderum put up with six innings of pitching where he was in deep trouble a few times. He managed to get out of the jam but the team let two runs of which none were earned. Meanwhile the Gothenburg offense managed to produce three runs in the third and fourth. Curtis Dionne took over on the mound and kept the opponents scoreless in the seventh. He had to see the first batter in the eight get on base and then gave up a go ahead homer to Philip Gajzler. Curtis managed one more out before giving up the mound to Wilhelm Sundin who quickly shut down the inning with a double play. Wilhelm’s pithing seems to have improved a lot the past year. A completely different speed in the pitches than what we’ve seen before. Curtis was at bat with two outs and two Sharks on base in the eight caused some extra discussions among the fans afterwards. Curtis appeared to have checked his swing well ahead of the plate with full count on the board, but the plate umpire wasn’t sure and asked for the assistance of the second umpire. He was well positioned between the mound and the short stop and decided that he did not check his swing tearing down all comeback chances for Gothenburg there. Curtis managed to calm down after some initial frustration. That wasn’t something Johan Weidlolf managed to do in the top ninth where he was sent back to the dugout to calm down. What seemed to be a very solid play to second to get ahead of the runner was turned down by the very same umpire that put Curtis away earlier. Home plate ump couldn’t be of any help to overturn the decision and due to that play the Sundbyberg managed to score two more runs, setting the final score to 6-3 in favor of Sundbyberg. It seems like the Sharks haven’t earned that extra little help of a correct bounce, a critical decision going their way just yet. The infield defense it a huge problem just now. Joe Lankford moved into the short stop position for the second game and Johan Weidolf taking over the third base, which gave that little extra stability that the Sharks were looking for. The catcher position and second base are still looking for some reliability and consistency. Jason put up with some solid pitching but seemed to lose his concentration a few times almost costing him a stolen base, a pair of hit by pitch and an error at first base after leaving the mound. His offense and pitching is very impressive though. The Sharks other American Patrick Laffin is putting up a solid .368 for the season but was kind of quiet the last game. I’m not sure that he saw a single ball coming his way at center field the second game and put up with one hit. He went two for three in the first game. The defensive adjustments moving Joe Lankford to short stop and Weidolf to third and having Nicklas Ekström taking on first really tightened that infield defense, making it much harder for the Sundbyberg to get on base. Even though the Sharks were reinforced with Curtis Dionne the second game making a huge difference, the team came out as a different team. They stood up for one another and really dared to make the plays! A much wanted shift mentally giving them some confidence for the future. Even though the Sharks still are looking for a win this season, that game is getting closer by the minute. They showed off some impressive come back will in game two giving them a chance to come back on top. Perhaps on Thursday vs the Swedish Academy? Will you support the Sharks at Shark Park versus the future of Swedish baseball? This entry was posted in Gothenburg Sharks on May 26, 2014 by Marcus.